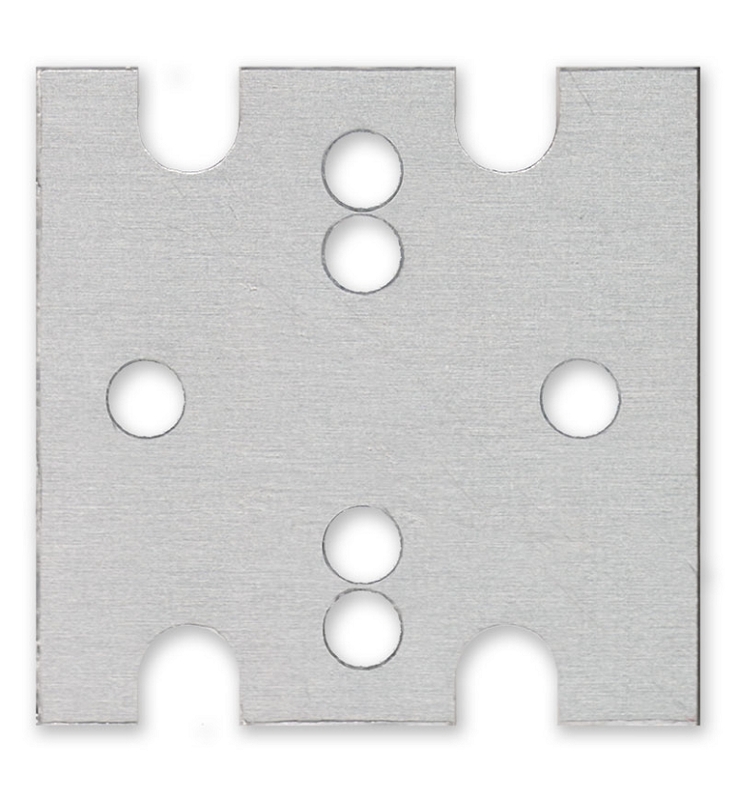 The SZ-05-S4 LED module can produce 2500 milliwatts of light power when powered at 500mA, and with proper cooling can be pushed as high as 4640 milliwatts when powered at it's maximum current rating of 1000mA. 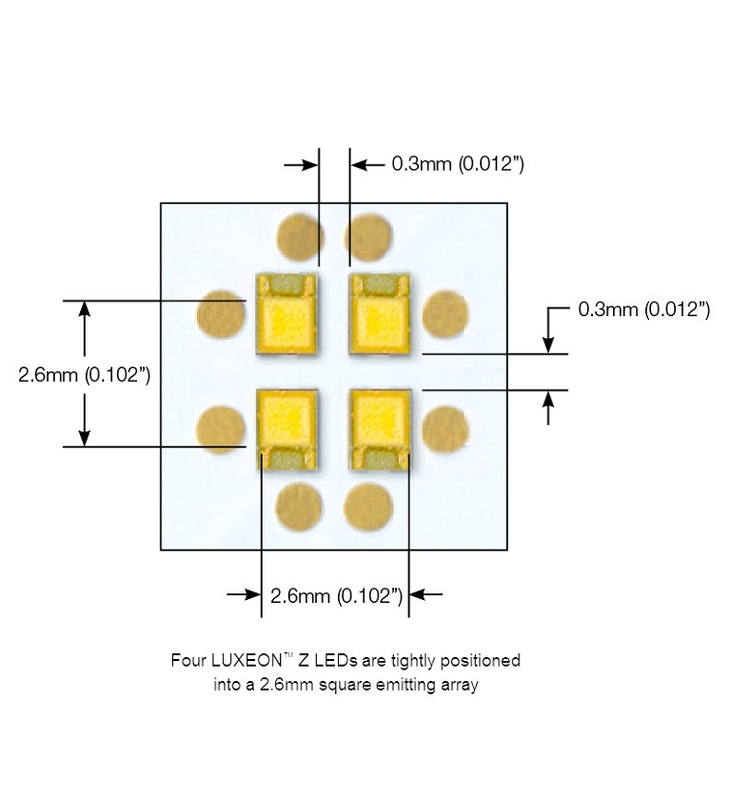 This remarkable level of light power is accomplished with 4 tightly positioned, series connected, LHUV-0415-0600 415nm LUXEON Z LEDs soldered to a thermally efficient, 20mm (0.8") square, 1.6mm (0.063") thick MCPCB aluminum base. Typical power output of center flux bin. 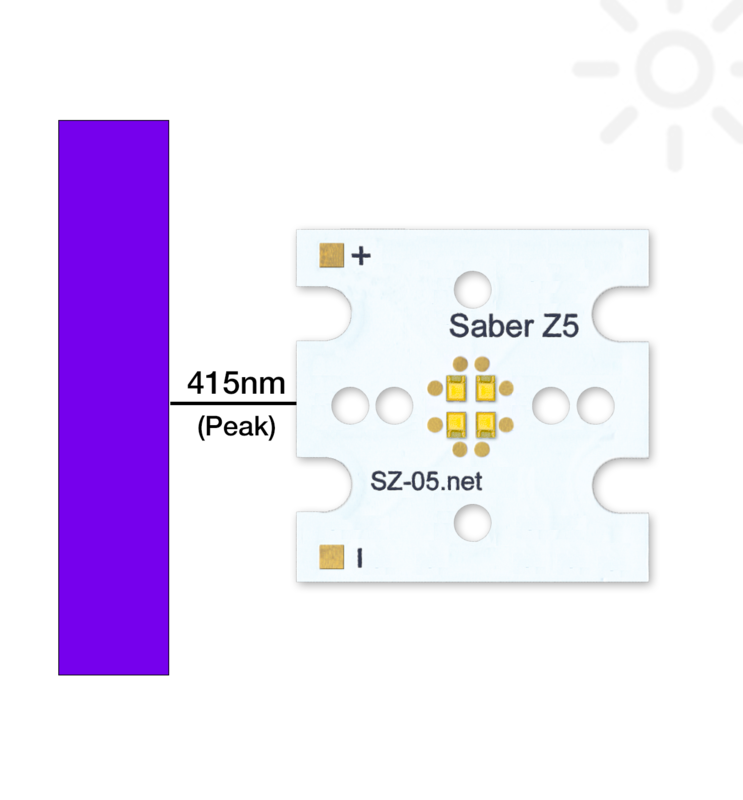 The Saber Z5 must be operated in a manner that will ensure that the junction temperature of the LEDs are kept well below the maximum ratings as specified in the LED datasheet. A heat sink must always be used when operating this module. The size of the heat sink will depend on the ambient temperature and the current that is used to power the LEDs. Bench testing that we have conducted with a SZ-05 module with all LEDs powered at 700mA in an open air environment and an ambient temperature of 25°C has indicated that a heat sink with a thermal rating of 10 C°/W or lower should be adequate. However, you will need to perform your own testing and analysis to determine if this size of heat sink will be suitable for your application. The Saber Z5 has been specifically designed to accommodate any Carclo 20mm optic that can be mounted into the Carclo 20mm Pegged Foot Optic Holder. You will find a complete list of 100% compatible optics here.